My mother taught me how to play hopscotch and how to play jacks and how to make houses out of cards. She, an only child, taught me, her only child, the things she did as a child. And in doing so, she taught me how to entertain myself, to find activity in unstructured time. Such was the nature of play, then, many years ago. Now my play? Blogging. Gwen Stefani released a photo taken by a family member of Gwen with her new baby Zuma. What makes this interesting is that the photo was released under a Creative Commons license rather than being sold to the media for use as has been the case with other high-profile celebrity stars upon the births of their latest baby. 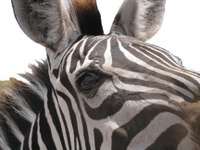 Copyright issues are changing rapidly and the Creative Commons license is being used more and more. This site is under a CC license. However, in the arena of profiting from personal news, Stefani's move to put her photo out for free (with some restrictions) is newsworthy. 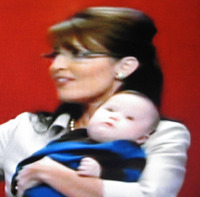 My takeaway on the Punctum of Palin, the place where new growth might happen in our culture of parenting? Not only how everyone loved on Trig, our new poster child for Down Syndrome and Special Needs, but how finally there might be an advocate for parents who struggle mightily with children of special needs. She primed us for the social problem of it all. Whether or not she makes it to the White House, someone big needs to advocate for parents who are under so much stress to take care of needy children. Palin's family was tribally presented, unusual for Americans (not counting the Kennedys who can be linked to the beginning of the Special Olympics). We do need a tribal orientation to this issue. Nuclear families can't handle it alone. Women, alone, can't have it all, can't do it all. I've seen marriages of parents with autistic children break up. I've lived next door to a mother who dealt with two children with special needs and I'm sure you have friends and family, too, who are overwhelmed with the stress of it and the struggle to provide the needed care. My heart was most captured by Piper, doting on baby Trig in a completely unstaged gesture of love. An unforgettable innocent moment in the midst of all the politics. Drill, baby, drill. Drill, baby, drill. Drill, baby, drill. The chant should be for more than oil. Man, it takes a village. Hillary had it right, she just didn't have more kids. This is dedicated to two friends who are taking up horseback riding again, at 50. Cowgirls used to entertain audiences with stunts like this... this is beautiful work with horses. Think if you could work with children in such harmony...perhaps some of us can. My children experienced swimming in rivers, rafting the Guadalupe in Texas or the Comal. I wanted them to know how ropes worked over the river and wildness. Weren't these things part of your childhood? A sure way to beat the heat? A is for Always, because that is what motherhood makes you. Always changed, Always a mom. Twenty five years ago I held my firstborn child in my arms, discovered what unshakable bonds motherhood creates and wondered, about six weeks later, when "things would return to normal." Just as quick as I wondered that thought, I realized that the State of Normal had changed. Motherhood creates a new normal, a new forever state of being. Just like I wondered what this child would look like, what this child would be like, I remain amazed, always amazed, how she has grown up. A is for always, the state that motherhood creates. Always entwined, always there, always, always and forever, a mother. Last one buckled has to snort like a pig. It worked. No more nagging, no more frustration trying to gain cooperation so mom can put the car in gear. It worked for years and years. Learning letters and phonics: The Letter of the Week taped to the dashboard. Spot everything you can starting with that letter. My children became good readers. Raffi songs and other catchy tunes that we could all sing together and still can. Nursery rhymes on the go. We all can burst into a shared commmon thing. Years later, still. Periodic required audio book time on long trips. Who knew that Steven Hawking used a voice synthesizer? Who would have ever thought that a daughter would know Maya Angelou's voice before she ever saw her in person? That was before the children signed driving contracts, and I had to resist the urge to slam my foot into the non-existent brake on the passenger side as they learned to drive. That was before the driveway crashes and teaching responsibility for the upkeep of a car and all the lessons to be learned from that big step to independence. That was before I coordinated the DA to come talk to highschool students about drinking and driving and went to funerals for kids that were killed driving. That was before we walked to a wreck of a teenager racing down our street in Atlanta, killed by his own carelessness. Funny, but it has been a long time since anyone snorted like a pig under threat. I guess kids do finally learn things without mom reminding them. This has to rank among my favorite books if only because I learned to read with the rhythm and rhymes of the words of Dr. Seuss. cuh aaaa tttt. cat. This book was published in 1957 and Seuss wrote it specifically to teach children to read. My mother (who is now on her 88th book this year) took me to the library every week as a child. It still lingers in the minds of many and was even quoted in the Senate (Harry Reid used the line, "'That is good,' said the fish. 'He's gone away, yes. But your mother will come. She will find this big mess.'" to describe the immigration impass). After taking my children to hear Texas author, cowboy and rancher John Erickson perform one of his readings from his series, Hank the Cowdog, my children began reading his books to his tapes. I think I could thank Erickson's literal readings of his Hank yarns with his own music and character voices for the excellent reading skills of my son. Erickson had tried to find a national publisher but wasn't tremendously successful until he published regionally. I'm not the only mother to credit a son's reading skills to Hank the Cowdog. 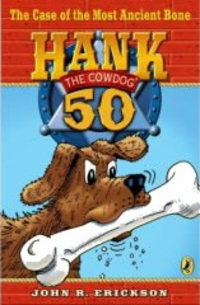 The Original Adventures of Hank the Cowdog has been re-released as a special 20th anniversary edition. Read the Amazon reviews. The Hank tales are a grassroots publishing success story. Dogs and cats and the love of reading. Yee-haw, giddyup page turnin' fun. 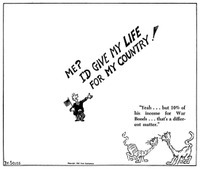 Seuss honed his cats and talents as a political cartoonist during WWII, for a NYC tabloid, writes Shamindar Dulai, a student writing about photojournalism on his post about truth and posting this Seuss cartoon, left. Erickson didn't write children's books at first, either. Parents are discouraged that their children don't take up reading as we did. Don't lifelong readers make life long learners? Does reading Facebook count?